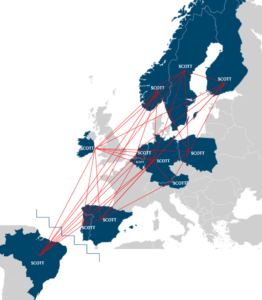 The excellent partner consortium of SCOTT facilitates comprehensive vertical integration in different areas, covering the full value chain from silicon to end-users and operators. 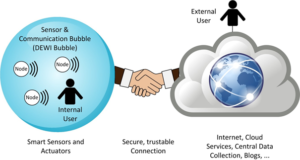 By providing reference implementations, SCOTT aims at establishing an eco-system for trustable wireless solutions and services for both professional and private users by attracting 3rd parties and particularly SMEs. This together with the involvement of open innovation approaches and stakeholder engagement as well as close cooperation with AIOTI, the Alliance for Internet of Things Innovation, and other cluster organizations all over Europe will further boost and exploit the growing “Internet economy”. SCOTT will open up new market opportunities for the European industry, will significantly reduce time to market and decrease costs for trustable wireless solutions on the market, in particular by using new designs and technical building blocks. SCOTT will develop methods and tools capable of meeting prospect use-case requirements on reliability, robustness, security and functional safety even in harsh and/or not trusted environments. Ultimately, SCOTT will foster the European leadership for Smart and Connected Things (including Internet of Things) and will strengthen Europe’s independence for security enabling components and systems.